A strategy for designing innovative quilts that are inspired by images of places you love and want to remember - creating experimental collages from fragments of your own photographs. The collage designs are simply another way of 'sketching', in which ideas can be effortlessly altered and revised to become abstract compositions that result in a 'map' of a potential quilt. The colors, patterns, textures and compositions of the collage are then translated into fabric, transforming a 'paper quilt' into cloth, creating an original quilt that only you can make. Illustrated with Judi's quilts and those of her workshop students. "Judi's process, solidly grounded in classic design principles yet fluidly accommodating of different aesthetics, fosters extraordinary creativity. She teaches you how to design by combining elements and images from your own photographs. Thus, the quilt you make is a purely individual expression of your own composition as well as your fabric and finishing choices." "Get ready to be inspired to make your own collage quilt. 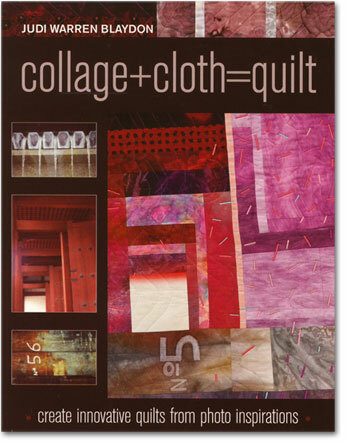 This book features how to make creative quilts from photographs. Have you recently taken a trip overseas? Use the photos from your trip to create a blueprint, then using your stash, cut out the coordinating fabrics for your very own collage quilt. Judi shows you how to zoom in and crop your photos to create interesting details and textures. Perfect for adventurous beginner quilters or for advanced quilters, your imagination is your limit with this book." Judi is also the author of "Fabric Postcards: Landmarks and Landscapes/Monuments and Meadows" (AQS 1994), and has written articles for Quilts Japan Magazine, Patchwork Quilt Tsushin and American Quilter.